I was thinking today how my life at the stiks and bricks was so..frivolous! I got up in the morning and fed the dogs. Had coffee and then drove to my studio where I got to paint and create all day. The reason I say frivolous is because we got our chassis battery! Here are our battery storage area. The two on the right are our house batteries. The one on the left, our Chassis battery. Now, if you know anything about batteries, you may already see it. But I will tell you . 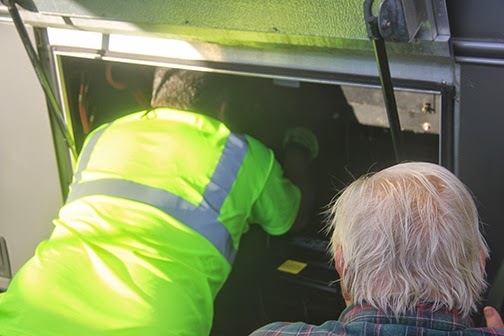 The installation of the chassis battery. And this is what I was talking about in the first photo. 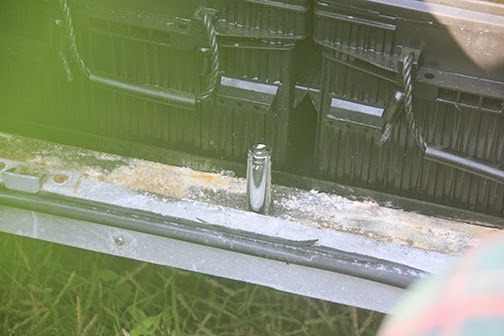 That "dust" is acid corrosion. I noticed it a few weeks ago for the first time and thought, hmm, need to clean that off. What I should have been thinking is, Holy cow, we may have a leak in the right side battery! The man tested the house batteries while the rig was running and we weren't getting good power from that far right one. He said maybe a leak from a cracked cap from turning it too tight or the battery trying to compensate and boiled up and thus the leak. I heard him say "dangerous" and that's all I needed to hear. 7 UP poured on the corrosion will take it off so off I rode to Stuckeys to get 4 bottles. I wanted to see the guy do it so we would know in the future, if. He poured three bottles over the edge where you see the white "powder" and along the back and side. Finally pouring all over the top of the batteries themselves. We saw the bubbles and he told us when it stopped the acid would be neutralized and we could wipe it all off. He did. 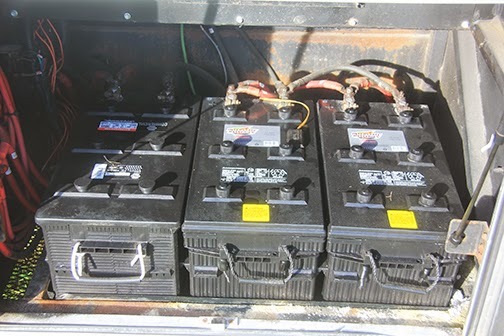 We thought they were deep cycle batteries but they aren't, so saving to get those when these need to be replaced. I'll tell you, I'm all for replacing that leaky one if it continues. We'll watch it over the next few days. The other thing we learned during this, is to shut off the Chassis battery while we are just parked for awhile. I just had Roger show me where that shut off was. Just one more wake up of what we don't know about our rig. We have three books on the workings of the electric systems in a Motorhome, which is different than your house, so I'm about to dive in to those. Each one of us needs to know how every aspect of our Rig works because as you know, two heads are better than one!!! So, when I know everything maybe I can take a few days to be frivolous...even if it's wearing my heel sandals while wielding a wrench!!! Oh boy - things to learn! Totally!!! Cleaning glasses as we speak!! Oh, golly, just looked at the first three words of my response! Guess I had our head colds on my mind. Sorry! LOL,LOL I thought that when I read it. Feel better and safe journey!! !